Silver Surfer rode the Annihilation Wave, Dr Strange is Avenging, Hulk saw red and Namor was the fish out of water in the X-books. With the four most famous Defenders soaring high, makes sense Marvel's latest teasers seemingly point to a new series for the team in December. The month even sounds like 'Defender' for Peter Parker's sake! With Marvel's motive one Comic Con reveal away, today is time to put aside the Iron Fist, Red She-Hulk, Doctor Strange, Silver Surfer and the Hulk based teasers, and figure out who my "non-team" would be if it was I Marvel had chucked in the writer's desk. Behold! VALKYRIE A tried and true Defender of old, give the Asgardian back her winged horse and forget it - she ain't goin' anywhere. CAPTAIN UNIVERSE Wicked huh? I love the idea one of the most powerful members of the team is just a random Joe or Josephine Blogs the Captain Universe persona chose as it's host five minutes earlier. DR STRANGE The crazy dimensions, locations and possibilities having Dr Strange on the team allows means it would be hard to remove Stephen from the roster, even if he wasn't essential to it's creation. Just leave him in the original costume okay? A classic is a classic folks. MR FIXIT Talk about comic characters cut short before their time! Hulk's run as mob man Joe Fixit blew the roof off awesome on a regular basis. Not only does an Al Pacino Hulk make for a killer visual and add to the muscle of the team - just think of the sweet one-liners! SANDMAN Arguably my favourite Marvel character of all, Sandman's attempts to reform and fly right usually crumble into dust. But here Flint's strength and versatility would be a perfect match for the team other teams look at sidewards anyway. 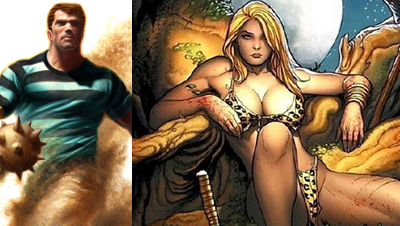 SHANNA THE SHE DEVIL Originally I was going to end this list with Ka-Zar, but decided to opt for the brains of the Savage Land instead - Shanna. With proven survival skills and instincts, the bikini clad culture shock herself rounds out the team ah-hurm nicely. So that's my dream Defenders line-up! Who is in yours? nice selection Dan. although now that you mention it Capt. 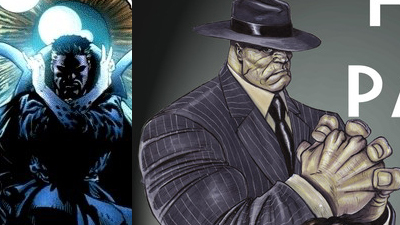 Universe would have been a good addition to The Annihilators too. that has got to be the coolest rendering of sandman i've ever seen! and as for Sheen, i just don't even have the words. notice how her chest seems to be glowing? and how about that little strip of loin clothe between her . . .oh never mind this is a PG rated blog not R rated like mine are. Craig you wanna help me out here? Sandman is always an interesting character, a bit on the fence (and trying not to spill a grain and failling all the time). Shanna and Kazzar are two of my childhood favorite characters, so I'd wellcome any of them at any tittle. 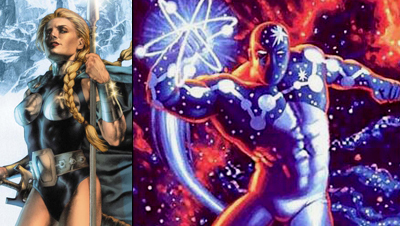 I agree Dave - Captain Universe would've been great - especially how DnA love digging up retro characters! As for Shanna's light up chest, maybe she thought she'd sell more if she looked a little like Iron Man? I love Ka-Zar too Aliera - the current mini of his isn't hitting the right notes for me at the moment, but he, his girlfriend and the Savage Land are far too cool to be left in the dark ages. Mr Fixit is my all time best Hulk ever. I know even wonder what Mr Fixit would add when I watch Scarface, so that's some impression! Glad you all liked the picks!